preethi eco plus jar mixer with 550 watts motor Model for trouble free, durable performance with 110 volts as a mixie, mixer, blender, wet grinder. 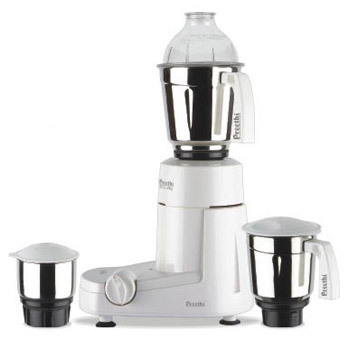 This is Not Preethi Eco Twin Mixer with 2 jar. This modal comes with 3 jar. The Preethi 'Eco Chef' is an ISI certified Mixer Grinder and comes with an affordable pricing and excellent performance. 'Eco chef' has powerful 550 Watts Motor that makes grinding faster and simpler. The Jars and Blades are made of rust-proof stainless steel material. Jar Configuration: 1.5 litres S.S Jar, 1.0 litres S.S Jar, 0.33 litres Chutney Grinder Jar. Speed Controls: Rotary Switch with 3 speed and Incher. Unbreakable polycarbnate Dome and Lid .